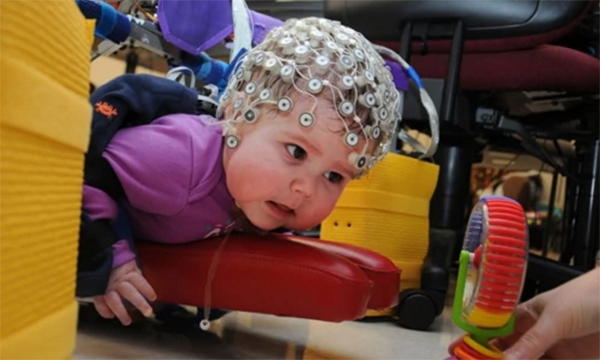 Engineers in the United States have built a device which enables babies with cerebral palsy to crawl. The device called a self-initiated prone powered crawler (SIPPC) was demonstrated in an innovation festival in Washington DC. The aim of the robotic machine is to ensure that babies with cerebral palsy do not miss out on crawling – which is a vital milestone essential for mobility and for intellectual development. While using the SIPPC, the child is in the prone position, using his/her limbs to manoeuvre the robot. They can learn that they have control over the robot while their ability to interact with the environment increases their motivation to use the device. Every move made by the child on the SIPPC is tracked and a transmitter cap, which is worn by the child, enables scientists to see how the child’s brain is being stimulated. This invention is being seen as revolutionary, as not only does it make a difference to the lives of the children who use it, but the transmitter cap opens up research possibilities for mapping and learning about the brain of children with cerebral palsy. A truly ingenious invention, which could really make a difference to people with cerebral palsy. Sheikh K (2016) New robot helps babies with cerebral palsy learning to crawl. Scientific American.